On 5 July 2013, BTWT published the first part of the imaginary diary of a railway enthusiast exploring the magnificent narrow gauge railways of the Kujawy region of Poland in 1939. Carefully researched by ‘Inzynier’ and brilliantly presented by narrow gauge expert Ed Beale, they are an evocative recreation of a lost world. A very early postcard view of Anastazewo station. Around 5am we are woken from our slumber in the loco depot at Anastazewo as work starts on preparing the loco and train for the 06:00 departure. Half an hour or so later we start to hear a train approaching from the east and at 05:48 the connecting service from Konin (Tuesdays and Fridays only) rolls across the level crossing and into the station. The locomotive is another 0-8-0T, bearing the number D1-345, while the train consists of two coaches (but no passengers), the usual van and three open wagons(31). One of the coaches appears to have been converted from a freight van, while the other is purpose-built. Mail bags are exchanged between trains (and one goes into the station building), while one of the wagons (presumably loaded, as it is sheeted over) is added to the Gniezno train. At 06:00 No. 6 and its train depart westward. D1-345 takes water, shunts the other two wagons into the siding and couples up to the coaches, while the fireman prepares his fire for the journey ahead and the injector sings as the water level rises in the boiler. Unlike the Gniezno men, this crew from Konin do not have the luxury of a few hours’ sleep before starting the return journey; they ‘clocked on’ quite a few hours ago, set out from their home station at 03:35, and will not get back until 08:35. All too soon for the fireman it is time to depart and we join the other three passengers who have arrived at the station to board the 06:12 departure. The train shuffles out of the station (the locomotive is fitted with a spark arrestor on the chimney, which muffles any real ‘chuff’) and back across the road as the next stage of our journey begins(32). A much more recent departure from Anastazewo, at the turn of the 1980s/90s. Photo Milosz Telesinski. So far all of our travels have been on railways owned and operated by the respective local authorities (Jarocin, Wrzesnia and Gniezno). Now we are on the state railway system but ironically the locomotive and coaches seem inferior to anything we have previously experienced. We briefly run alongside the road, cross over it again and run along the other side of it. After about a kilometre a branch trails in on the right, this is Goslawice sugar factory’s 7 km line to beet loading points at Naprusewo(33). Our train trundles over a road junction and we find the road is on our right instead of left, but that soon changes when we cross to the other side again. Various other trackways are crossed and then we leave the road for a while. Curving to the left we cross a small river and another couple of roadways and arrive at Budzislaw Koscielny halt. Here another Goslawice sugar factory line trails in, this time from the left and with a loop; it runs 4 km to a loading point at Marszewo(34). Anastazewo to Budzislaw-Koscielny and branches. Extract from the WIG map of 1935. A small crowd is awaiting the train at Budzislaw and perhaps a dozen people board the train, most carrying baskets full of produce, while those with more bulky goods load them into the van. Within a minute or so we are on our way again, alongside a road for a couple of kilometres to the next halt at Nieborzyn, where the three waiting passengers quickly climb aboard. Shortly after the halt, the road crosses to our other side, but roadside running remains the order of the day until we cross over again and then curve away from the road on the approach to Zlotkow. This halt has a loop and another handful of passengers join the train. There now follows a fairly straight section across open country, crossing the odd road or watercourse, to Dankow, another halt with a loading siding, at which another couple of passengers board. Shortly after Dankow comes a pair of tight bends, then we cross a couple of streams and finally cross the road into Jablonka Slupecka, a quite sizeable station with loops and a number of sidings holding various wagons and vans, as well as the line from Sompolno trailing in from the east. The 14 km from Anastazewo have taken us 53 minutes to cover (16 kph or 10 mph), but the importance of Jablonka is underlined by the fact that the train pauses here for 17 minutes – the loco takes water and the fireman again tends to his fire, while another half dozen or so passengers join the train. Meanwhile, another 0-8-0T, number D1-332, is shunting wagons from one siding to another(35). 31) D1-345 was a ‘Brigadelok’ built by Henschel (works number 13312) in 1915 and initially numbered HF 349. It was amongst the locomotives inherited by PKP when the Kujawy system was taken over after the First World War. It remained on the system until the Second World War, when it became DR’s 99 1553, but was taken away from the system during that war and nothing further is known about it. 32) The Anastezewo – Maly Patnow section was built by Goslawice sugar factory in 1912 as a 750mm gauge ‘industrial’ railway. It was converted to 600mm gauge by the invading Germans in 1914, passenger services later started and the line was taken over by PKP after the First World War. It was converted back to 750mm gauge in the 1950s, but passenger services west of Jablonka Slupecka ceased in 1954/5. Jablonka Slupecka – Maly Patnow closed in 1965 as a result of brown coal mining in the area. Freight traffic on the remaining section gradually declined to zero, but it remained in place as a link between the Gniezno and Sompolno operations. Following cessation of PKP narrow gauge operations in 2001 it was officially transferred to the Gniezno division, but saw no regular traffic and sections have since been lifted to facilitate further brown coal mining. 33) Goslawice sugar factory’s branch to Naprusewo was built to 600mm gauge in the 1920s and regauged to 750mm in the 1950s. It closed in about 1975. 34) Goslawice sugar factory’s branch to Marszewo was built in the 1920s to 600mm gauge. It probably closed in the 1950s when the other lines were regauged. 35) D1-332 was a ‘Brigadelok’ built by Henschel (works number 12557) in 1914 and initially numbered HF 255. It was amongst the locomotives inherited by PKP when the Kujawy system was taken over after the First World War. It remained on the system until the Second World War, when it became DR’s 99 1548. It was taken away from the system during that war but later returned and became PKP’s Tx1-328. It went to Rogow about 1950, to Mlawa on 1st September 1954 and was withdrawn on 16th November 1955. Tx2-355 in later years at Koronowo (1969). This locomotive arrived in Gniezno around 1937. Photo Ton Pruissen. Today we are to travel to the eastern end of the Gniezno system at Anastazewo. However, the Mondays and Thursdays train to that station runs late in the day, so we spend some time looking round the city: the cathedral, main square and surrounding streets are all delightful. We have a relaxed time and gradually make our way to the main station. We pause here relatively briefly, conscious that prolonged observation of standard gauge operations may arouse suspicions of spying. Soon, therefore, we find ourselves back at the narrow gauge station which, in contrast to the hive of activity at the standard gauge station, is quietly slumbering in the afternoon sunshine. The loco depot and workshops are conveniently located alongside the station building, so we are able to observe the motive power fleet. Inside the shed we can just see 0-6-0T+Ts Nos. 7 and 8, while 0-8-0T No. 9 is in steam in front of the shed and 0-8-0T+T No. 10 is parked in a nearby siding(25). 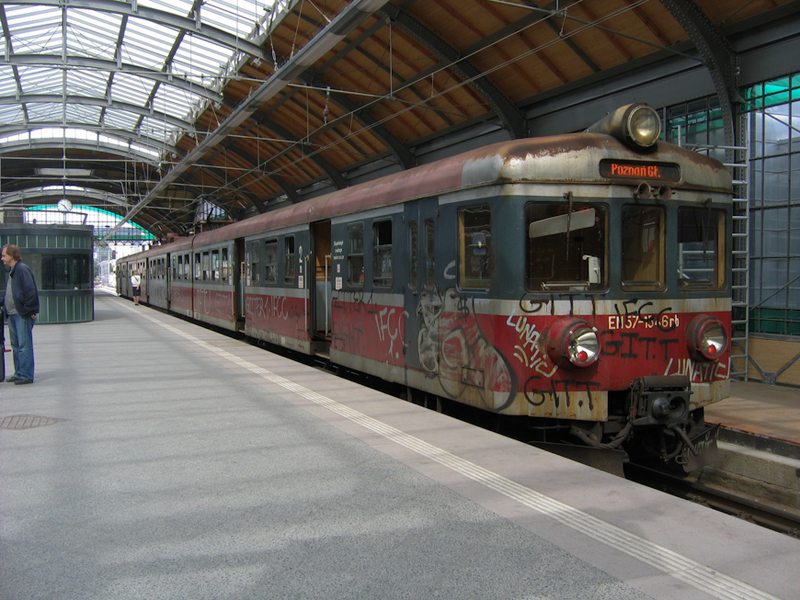 There are also railcars 2 and 3(26). Eventually there are signs of life and railcar 3 trundles across to the platform to form the 16.50 service to Witkowo. As departure time nears, a respectable number of passengers arrive, having finished their day’s business in the city, and the last few find it is standing room only. As we head out of the city a number of people leave the train at the various halts. Not until a brief stop at Niechanowo do any passengers join the train – from that point we are on new territory and start to pay more attention to our surroundings. Witkowo. The narrow gauge railway runs mainly in the roadside verge. Extract from the WIG map of 1935. The railway runs alongside a lane to the halt at Miroszka, with its loading loop by the farm, at which a couple of people get off(27). We continue alongside the lane, crossing a few trackways, and then re-join the main Witkowo road shortly before the halt (and loading loop) at Malachowo. We then cross the road but continue alongside it and pass another loading loop. 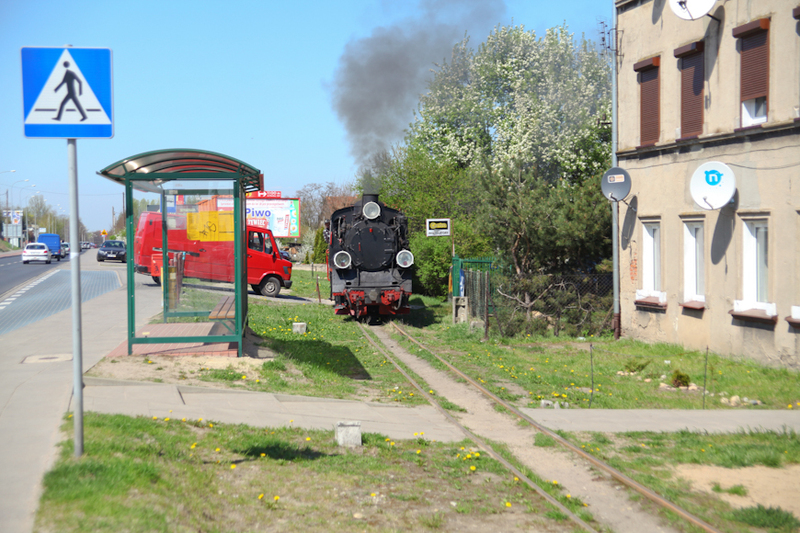 Then, approaching Witkowo, we cross the road again and enter the station, where a couple of sidings hold a few wagons. The train terminates here and, as it will be a few hours before another train arrives to take us on to Anastazewo, we head into the town square to find some sustenance at a cafe. The 16km journey has taken 38 minutes, an average speed of 25kph, again showing the advantages of railcars. After our meal we wander round the town and back to the station and we now take the opportunity to study our surroundings. Witkowo was the original terminus of the railway and the first thing we notice is that the station building is at an angle to the platform and through tracks; until the 1920s the main line ran on the other side of the building and for about half a kilometre was some way to the north of the current alignment. The former station tracks are now sidings, from the furthest north of which a line runs back westward to serve, via a wagon turntable, a warehouse. On the current main line there is a passing loop, and to the south a fan of sidings serves a store and weighbridge, but of the three road loco depot only the turntable remains, the shed itself having been demolished a few years ago. Eventually, the 21.20 for Anastazewo arrives behind 0-8-0T No. 6(28). The three coaches and van that make up the train are well in excess of requirements for this time of day (there appear to be only two other passengers) but will no doubt be required for the return working tomorrow morning as the train heads into the city. We swiftly board the train and are on our way again, crossing a street and passing through a freight yard, from which a field railway branches north for perhaps a couple of kilometres to serve a farm(29). Passing round the northern side of town, the line crosses another street, following which a siding runs off to the right to serve a timber yard. After a few more streets there follows a siding to the left serving a sawmill, then we swing right to cross the road to Powidz, alongside which we run to the halt at Strzyzewo. Then we cross the road and run round the north side of the village before coming alongside the road again on our right. After running alongside the road for some time we cross over to the south side, pass the halt and loading loop at Wiekowo and cross back to the north side, run parallel to the road again for a while and then curve away to the north, past the halt and loading loop at Lugi, followed by the siding running back to the right to serve the sand/gravel workings. Powidz and Przybrodzin. Extract from the WIG map of 1935. In contrast to the previous section, which was mostly straight or nearly so, the next kilometre or two see us winding through fields and scrub until we reach a trackway, which we follow for a while, passing the halt at Charbin. Then come two tight curves, interspersed with a straight section alongside another track, following which another section alongside a track takes us past a couple of sidings on the left to a sawmill; this was the terminus of a field railway which preceded the district railway. Soon comes Powidz station, where the other passengers leave the train. The layout of the station was clearly set out as a terminus, for the station building sits squarely across the end of the yard while the main line and passing loop curve sharply left. From the loop, three sidings branch off to the right, two terminating in front of the station building while the third leads to a turntable, with a line branching back from that to the two-road loco shed. Powidz Station between 1905 and 1915. After a brief pause we start away again, crossing the road(30). Again we pass round the north side of the town, cross a road and then run alongside the lake, passing Przybrodzin halt and then crossing an isthmus and passing the halts at Ostrowo Nowe and Ostrowo Stare, the latter having a loading loop on the left. We have now entered a wilderness of former frontier country and the halt at Rusin passes almost unnoticed in the fading light and the surrounding woodland. Finally, some 22km from Witkowo (38km from Gniezno), we pull into the former border station at Anastazewo. Anastazewo, the eastern end of the Gniezno district railway. Extract from the WIG map of 1935. It is after 10pm and the next train eastward will not depart until after 6am tomorrow. When this was a border crossing there were no doubt additional facilities but today it is, quite frankly, a station in the middle of nowhere, representing only the boundary between the Gniezno district railway to the west and the PKP railway to the east. 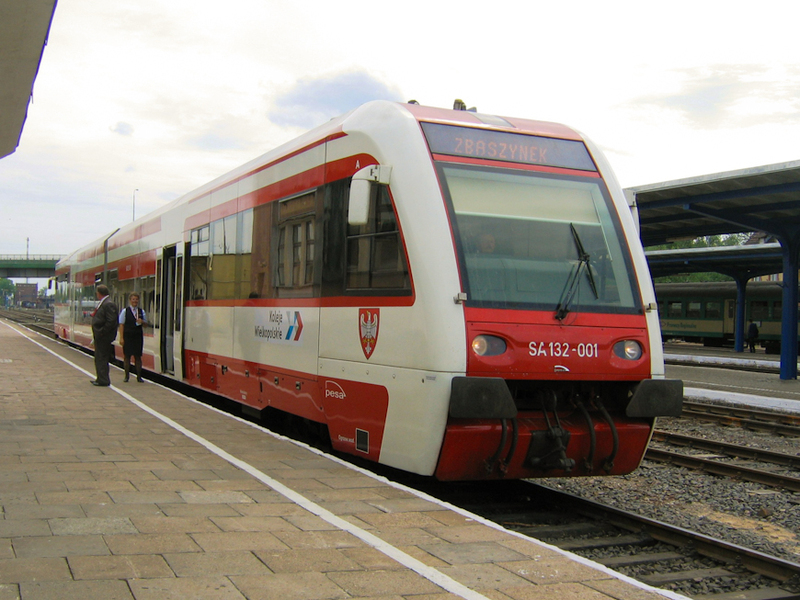 Our train has arrived on a line that terminates just short of the station building which, like that at Powidz, sits across the end of the station. To the left is the run-round loop and beyond that, on the other side of a roadway, a siding. To the right is the PKP line eastward, along with another run-round/passing loop, and the two-road loco depot. The crew spend some time watering No. 6, filling the boiler and banking the fire before leaving it to simmer for a few hours. Fortunately, as the temperature drops quite markedly, we are able to join the crew in the depot and grab a few hours’ sleep. Anastazewo in 1984 retained much of its earlier atmosphere despite the broader gauge. Video © Andrzej Mastalerz. 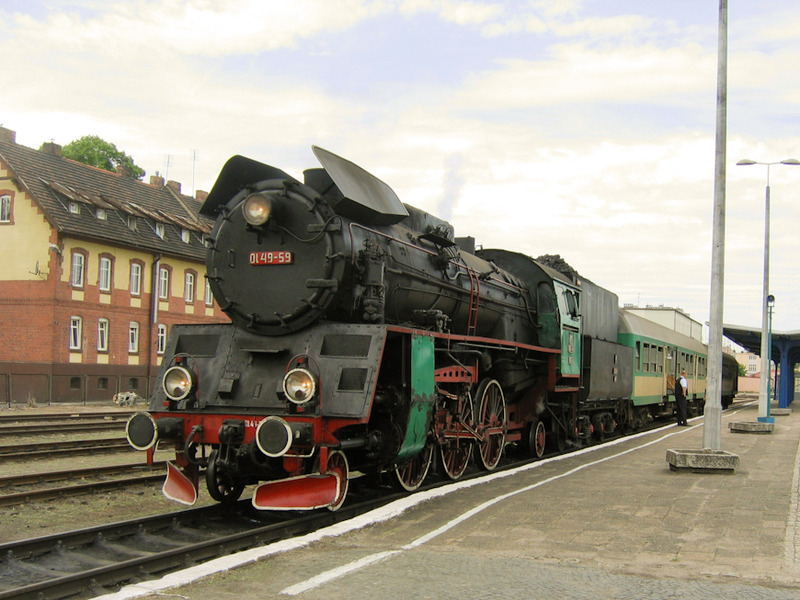 25) Gniezno 7 was Krauss works no 6624 of 1912, originally named ‘Anastazewo’. It was renumbered 1 in 1939 (I have assumed after the German occupation), and taken into PKP stock in 1949, becoming Py1-721. It was withdrawn in 1955. Gniezno 8 was Krauss works no 6803 of 1913, became 2 in 1939, PKP’s Py1-722 and was withdrawn in 1957. Gniezno 9 was Orenstein & Koppel works no 6960 of 1915, became 3 in 1939, went to Wrzesnia after 1945, became PKP’s Tx1-354 and went to Mlawa in 1956, became Tx2-354 from 1961 and was withdrawn in 1963. Gniezno 10 was Orenstein & Koppel works no 7865 of 1916, being bought on military instructions to serve Goslawice sugar factory during the First World War. It was renumbered 4 in 1939 and was scrapped or sold in 1949. 26) Gniezno’s railcar 2 was built in the railway’s own workshops in 1931, having a bogie at the front and a single axle at the rear. It was taken into PKP stock in 1949 and became Mzy-21. It was regauged to 750mm at Koronowo on the Bydgoszcz system and then went to the Gdansk system in March 1951, working from Lisewo, but was withdrawn in 1954. Railcar 3 was also built in the railway’s own workshops, in 1935, but had two bogies. It became PKP’s Mzx-045, was also regauged at Koronowo and sent to the Gdansk system in March 1951. In 1952 it was allocated to Lisewo but in 1953 was set aside due to the lack of spare parts. It was scrapped in 1956. 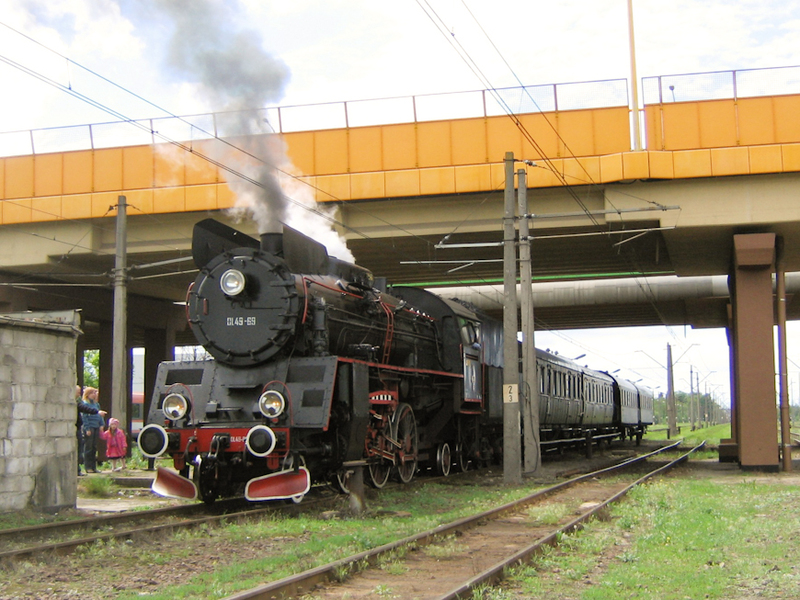 27) The Niechanowo – Witkowo section opened in 1896 and was converted to 750mm gauge in 1957. It is still open for tourist trains. 28) Gniezno 6 was Orenstein & Koppel works no 5020 of 1911. It was built for the German military and initially numbered HF 302. It became PKP’s D2-401 after the First World War and is believed to have worked on the Mlawa system until being sold to the Gniezno district railway in 1937 (more recent information suggests it did not arrive until after the German invasion). It was taken into PKP stock again in 1949 and became Tx1-355, went to Bialosliwie in 1956, then to Mlawa, and to Koronowo in 1962. It was withdrawn in 1970 and is now in the museum at Wenecja. 29) The Witkowo – Powidz section opened in 1897, was converted to 750mm gauge in 1957 and is still open for tourist trains. 30) Powidz – Anastazewo opened in 1911, was converted to 750mm gauge in 1957 and is still open for tourist trains as far as Ostrowo Stare, although the section beyond there is currently out of use due to the need for repairs to the track. Gniezno. 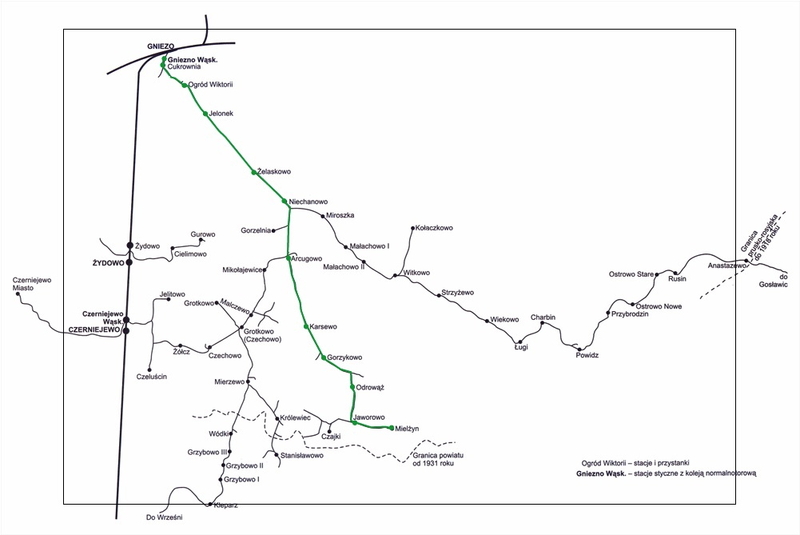 The narrow gauge line runs south east. Extract from the WIG map of 1935. The third day of our tour presents us with two problems. Firstly, we need to continue our journey across the network via Anastazewo, but that end of the Gniezno system has a rather sparse service. On Tuesdays and Fridays there is an afternoon working, while on Mondays and Thursdays there is an evening train to Anastazewo which overnights there and returns early on Tuesdays and Fridays. Today is Wednesday, so we have no way of reaching Anastazewo by train. Secondly, our mission is to cover the whole of the linked Kujawy system and yesterday we missed out the Mierzewo – Arcugowo section of the Gniezno railway, which links that system to the Wrzesnia line. Consequently, we resolve to spend the day covering the missing link on foot. Fortunately, the Gniezno – Powidz section of line has a daily passenger service, so we will be able to journey to and from Niechanowo by train and, as we will be staying in the same hotel tonight, we can travel rather more lightly for our railway ramble. The first departure of the day from Gniezno is at 09.15 (there was an arrival from Powidz at 07.40 to bring folk into the city), which turns out to be railcar No.1, built in Hannover in 1928(21). Passenger loadings are relatively light and the car’s 30 seats are more than sufficient as we re-trace yesterday’s route to Niechanowo. The advantages of the railcar are clear in terms of journey time, as we cover the 10km in just 22 minutes at an average speed of 27 km/h (17 mph). And so we start walking. From Niechanowo station we cross the Witkowo road and pass through the village, turning left (and crossing the field railway we saw yesterday) to eventually reach the crossroads by Arcugowo halt. Here we turn right, for the branch to Mierzewo runs along the right hand side of the road(22). Shortly before Mikolajewice the railway crosses the road and we follow it, skirting round the village, to the unused halt with a loop which clearly is used, as there are two wagons in it, one of them partly loaded with hay. The railway then heads south alongside a road, crossing a couple of streams and then crossing to the other side of the road and throwing off a short siding to the left that crosses back over the road. At Malczewo comes an oddity, for the railway passes under a road bridge. Why a bridge? From the topography it would seem that the railway could have crossed on the level, while the road is by no means a busy highway; indeed, a few kilometres to the east, the Mielzyn branch crosses the same road on the level. Continuing south of the bridge, the railway runs on the left hand side of another road and shortly a field railway branches back to the left; this splits into three branches, each perhaps a kilometre long. There is also a halt. The main line continues to Czechowo-Grotkowo (various names seem to have been used for this halt) which is a three-way junction beside a crossroads. To the right a field railway runs beside a cart track to the village and farm at Grotkowo, straight ahead runs the district railway’s branch to Czeluscin, with a loading loop alongside the road, while to the left is the main branch to Mierzewo, also alongside a road. We turn left and follow the road and railway for a couple of kilometres until the railway swings right, away from the road, to run behind the cottages of Mierzewo and then we come to the station at which we witnessed some shunting yesterday; today all is quiet here. It has taken us well over two hours at a stroll (anything more would be uncomfortable in the heat) to get here from Niechanowo, which is 9.6km by rail, and it is clear that although the narrow gauge trains may seem slow, they are an essential means of transport for the local population, for most of whom walking is the only alternative. Czechowo-Grotkowo and the Czeluscin branch. Extract from the WIG map of 1935. After a pause to rest our legs, we walk back to Czechowo-Grotkowo and, as we have plenty of time before the last train leaves Niechanowo, we decide to explore some of the Czeluscin branch. As previously indicated, the line runs along the left hand side of a road for almost two kilometres to Czechowo, where it crosses the road and a siding branches off right to the farm(23). The main branch continues alongside the road for a short distance, past a couple of ponds, and then turns right across fields. We pass what looks like a sand pit and then come alongside another road on our left. The railway crosses the road and heads across fields again to Zolcz, with a long siding branching off to the left for a few hundred metres. Crossing a couple of lanes in Zolcz the line continues west with a roadway on the right to a T junction, where the railway turns sharply south with another road still on the right. Somewhere along here another line branched off for a few years to a standard gauge interchange at Czerniejewo station, but the route has disappeared under the plough. Following the road and railway south from the junction we are amazed to see, as we approach Czeluscin, the smoke from a locomotive. As we get nearer we can see that it is Krauss 0-6-0T+T No. 4, one of about eight such locomotives built for this line and the Znin system between 1894 and 1913(24). What seems bizarre is that we can hear standard gauge trains on the Gniezno – Wrzesnia line and Czerniejewo station is less than 2km from Czeluscin, yet this locomotive has travelled about 24km from Gniezno to reach here; presumably it passed Czechowo-Grotkowo while we took our diversion to Mierzewo. As on the Wrzesnia line, when the crew see our interest in their locomotive we are invited to take a closer look and, when they finish their shunting and are ready to set off back towards Gniezno, we are invited to join the guard in his van, an offer we gratefully accept. The train by now consists of just the loco and van, but at Zolcz we stop to pick up a couple of empty wagons, and at Czechowo a wagon load of manure is added. At Czechowo-Grotkowo the loco uncouples from the train and runs up the siding to Grotkowo, reappearing with a couple of vans, while at Mikolajewice one of the wagons we saw earlier is now completely loaded with hay and is added to the train; at each stop there is a long break in the journey as, not only do the wagons have to be added to the train, but the guard has to do the necessary paperwork. On arrival at Arcugowo the loco again uncouples, as there are apparently some wagons to collect at Mielzyn. Not knowing how long the business at Mielzyn might take, we bid farewell to the crew and set off on foot again to Niechanowo. We arrive there in plenty of time to rest our feet before railcar 1 arrives from Powidz. After our day’s walking through the countryside it is a relief to know that we only now have the walk from the station to our hotel. There are only two other passengers by this time of day and all the halts are passed without stopping. As we near Gniezno the speed noticeably reduces, to avoid getting too far ahead of schedule, and soon we pull into the platform as a nearby church clock strikes 19.00. Tonight will be early to bed, for not only has our walk and fresh air taken its toll, but tomorrow we travel east towards the main Kujawy network and it will be a few days before we get another night in bed. 21) Gniezno’s railcar 1 was tested on the Mecklenburg-Pommersche Schmalspurbahn and possibly on the Bydgoszcz district railway before arriving at Gniezno in 1929. It was taken into PKP stock in 1949 and designated Mzx-044 but is believed to have been scrapped in 1950. 22) The Arcugowo – Mierzewo line opened in 1896 and was converted to 750mm gauge in 1957. Grotkowo – Mierzewo closed in 1979 and Arcugowo – Grotkowo in 1986. 23) Grotkowo – Czeluscin opened in 1916, as did Zolcz – Czerniejewo, but the latter closed in 1923. The Grotkowo to Czechowo section was converted to 750mm gauge in 1957, but Czechowo – Czeluscin was closed rather than regauged. Grotkowo to Czechowo closed in 1973. 24) Gniezno 4 was Krauss works no. 3179 of 1895. It was renumbered 8 in 1939 (I have assumed after the German occupation), and taken into PKP stock in 1949, becoming Py1-723. It was sold to industry in 1954 and its fate thereafter is unknown. The Mielzyn branch. Extract from the WIG map of 1935. The Jaworowo – Mielzyn section of the railway runs largely along the side of the road and Mielzyn station is the basic rural terminus consisting only of a run-round loop and a short siding to a turntable, the latter a relatively recent addition and only a lightweight affair suitable for turning railcars. We wander further into the village square, find a shop to buy some beer and head back to the station in time to see the afternoon train arrive at 15.01. Quite a number of passengers leave the train, presumably having returned from market in town. We are fortunate it is a Tuesday, as trains only serve Mielzyn on Tuesdays and Fridays, with a morning train which arrives at 06.35 and departs at 06.45, and this afternoon service which lingers at the station until 16.18. The locomotive is No. 12, a 0-8-0 tender locomotive built by the Warszawa factory in 1927(18). The train is the usual two coaches and a van, plus a few wagons which have been brought in; fortunately there are none waiting to leave, as this would make shunting rather complex. The coaching stock all dates from the early days of the district railway, with plates showing manufacturers to have been Weyer and Hofmann. The locomotive runs round the train, shunts the wagons into the loop and takes water, during which time the fireman also cleans the fire and moves coal forward in the tender; it will be tender-first back to Gniezno. As departure time nears, the fireman livens up the fire and a handful of passengers arrive. Then we are on our way again, initially running westward alongside the road we earlier walked and then turning north at Jaworowo, passing the halt without stopping(19). We soon join another road, which we follow through a couple of slight left hand curves to Odrowaz, a halt with a loading loop at which one passenger alights and a couple board the train. We cross a road and shortly curve left, at which point a branch comes in from the right; this runs a few hundred metres to a large farm. After a couple of kilometres through fields we cross a road and pass another halt with loop at Gorzykowo, following which we run roadside again to Karsewo, again a halt with loading loop(20). Crossing over a road junction in the centre of the village, we set out across fields, bridging over the occasional stream, then a road comes alongside again on our left for the run into Arcugowo. The ‘station’ itself has the usual loading loop and at the northern end a field railway branches off right to serve the estate farm. Arcugowo and Niechanowo. Extract from the WIG map of 1935. Leaving Arcugowo we cross the road and the line from Mierzewo comes in on the left, then we run through fields again to pass the village of Niechanowo, where another field railway heads back to the left, serving a distillery as well as the estate farm. We continue north to cross the Gniezno – Witkowo road and curve left across a couple of lanes as the Witkowo line comes in from the right at a triangular junction. Soon we are entering Niechanowo, one of the more significant stations on the Gniezno system with a station building and two-road loco shed which is also used as a wagon repair shop; the track layout is quite extensive, with three through lines, a siding and another line looping round the back of the yard. We pause for a minute or so as a few people leave or board the train and then the stationmaster gives a wave, the driver gives an acknowledging toot on the whistle and opens the regulator. Now that we are on the main line of the system, we seem to gather a little more pace and the halts are less frequent. At first the main road is some way off to our left and we pass through fields, crossing a couple of roads and watercourses, but at Zelazkowo (the usual halt and loop) we join the main road, which we follow to the edge of the city. The fields give way to woodland on both sides and then we pass Jelonek, a popular destination at weekends for excursions from the city. There is a loop from which a short siding leads to a turntable, and trains can be turned round here, but on this weekday afternoon we pass through without stopping. Soon we are passing sporadic ribbon development and we pause briefly at the simple halt of Ogrod Wiktorji, where one passenger alights. Here we cross the road and soon run through the outskirts of the city – the cemetery on our right, then the barracks off to our left; with a sports ground on our right we cross the Wrzesnia road. A triangle of tracks on the left then marks the junction with the line to the sugar factory, with sidings full of empty wagons at this time of year. Passing the factory buildings we enter the station yard and come to a halt in front of the workshops and station building. Some of the principal lines of the western part of the Kujawy Narrow Gauge Railways. Map gkw-gniezno.pl. The 23 kilometres from Mielzyn have taken us 1 hour and ten minutes – an average speed of almost 20km/h. Once again, we pick up our bags and walk across the long bridge over the standard gauge lines to find our hotel in the city. 18) Gniezno no. 12 was Warszawa works no. 094. It was renumbered 5 in 1939 (I have assumed after the German occupation), and taken into PKP stock in 1949, becoming Px1-771. It later went to Witaszyce and Zwierzyniec, became Px27-771 in 1961 and was withdrawn in 1964. 19) Mielzyn – Odrowaz officially opened in 1896 and was regauged to 750mm in 1957. It was officially closed in 1984, but had not seen any traffic since 1970. 20) Odrowaz – Niechanowo – Gniezno opened in 1883 as a 900mm gauge line to serve Gniezno sugar factory. In 1895 it was regauged to 600mm and became part of the Witkowo district railway, officially opening in 1896. It was regauged to 750mm in 1957. Mielzyn – Arcugowo closed in 1984 (as noted above, it had seen no trains for 14 years) and Arcugowo – Niechanowo officially closed in 1989 but was probably last used in 1986. 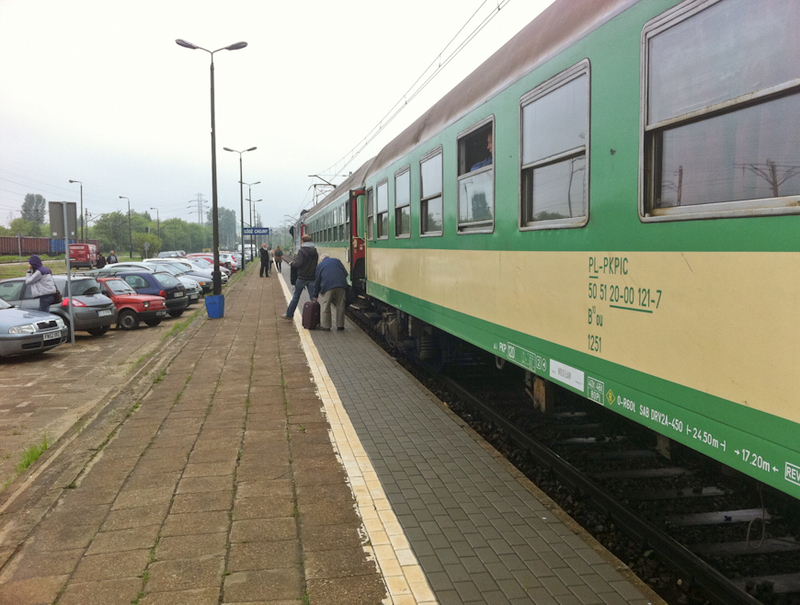 Niechanowo – Gniezno is still open for tourist trains. 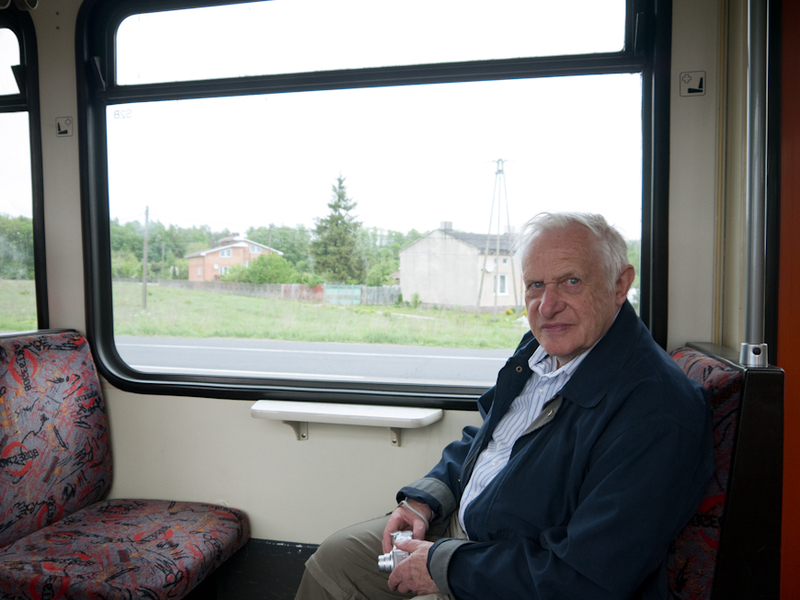 Chris White in an ex Duisberg articulated tram on inter-urban line 46 from Lodz to Ozorkow. Photo BTWT. Chris White has been involved in the Talyllyn Railway in North Wales since the 1950s. He started as volunteer guard and rose through the ranks to become the TR’s chairman. In the 1960s, he organised the Traffic and Operating Committee working parties some which were attended by Dyspozytor during his school holidays. Today, he is still actively involved in the operation of the TR and The Narrow Gauge Railway Museum in Tywyn. Between 9 and 16 May he came to Poland to explore some of Poland’s cities and their tramways, main line and tourist railways. This is his diary. A Ryanair flight from East Midlands airport to Wroclaw landed me just after 18:00 by the new airport terminal which is largely finished and very impressive. What a change from my first visit in 2006, when the city was approached from the small terminal by what a seemed to be a country lane lined with allotment gardens. Now the whole area is transformed with new roads and developments of all kinds. Bus 406 was waiting to take people to the city but there was no ticket machine at the stop, the one on the bus, which only takes plastic, was not working and the driver uninterested. So I just took a seat and relaxed. Soon the bus was packed to the doors and eventually set off and reached the city in good time. I stayed at Sifor Premium Europejski, as it was near to the station and not far from the city centre. In Wroclaw, I bought a 24 hour tram ticket and obtained train tickets for the next day from one of the various ticket outlets near but not at the Dworzec Tymczasowy (Temporary Station). A useful tram map showed two new lines, built since my last visit a year ago, to serve the newly complete Stadion Wroclaw and nearby Dokerska. I visited the city centre with its many monuments, botanical gardens and Szczytnicki Park with its musical fountain, the Centennial Hall built in 1913 to celebrate the liberation of the city from Napoleon and the 1948 steel needle erected to celebrate the regained territories. The light and airy interior of the restored station contrasts with this EN57 unit complete with the plastic seats ready to form the 10:30 Wroclaw Gl to Poznan Gl. Photo Chris White. Allowing myself plenty of time, I approached the station by a circuitous route and found the subway mentioned in the post Wroclaw Worries. When complete, the station will be modern and functional but whether there will be any passengers left to travel on the slow and, all too often, appalling trains, is another matter. Cheap and frequent local and regional bus services and a growing number of internal flights are alluring alternatives to those without a car. SA132 railcar making up the Koleje Wielkopolskie 12:35 Leszno to Wolstzyn and Zbaszynek. Photo Chris White. Clearly major improvements will be needed to re-gain and grow the passenger traffic and sort out the labyrinthine ticketing systems. I took the 10.30 (Regio 67931) as far as Leszno and changed onto the 12.35 Leszno to Wolstzyn arr 13.34 (KW 79427), a modern diesel railcar. It was staffed by four people, one to drive, one to issue tickets, one to operate the doors and one who appeared to be a trainee. Ol49-59 about to depart with the regular steam-hauled passenger working from Wolsztyn to Poznan. Photo Chris White. At Wolstzyn there was time to take a few photos before boarding (KW 77331) a steam train headed by OL49-59 departing at 13.40 for Poznan Głowny: a two hour run arriving at 15.47 . The filthy and dilapidated double deck carriages experienced on my previous trip last year had been replaced by two regular carriages but their interior and outside cleanliness left a lot to be desired. Both of these Koleje Wielkopolskie trains seemed to be enjoying a reasonable level of business. I was very interested to note the re-building of the traditional Prussian style signalling system in the Wolstzyn area. 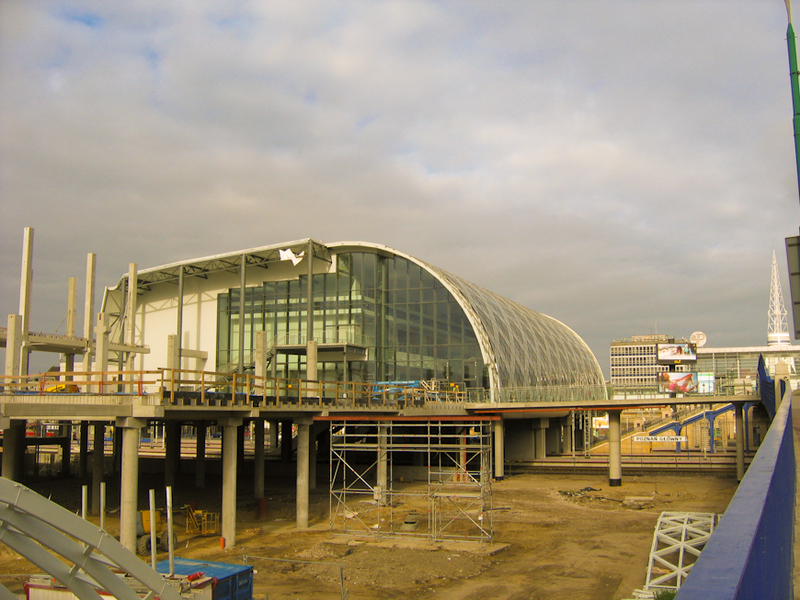 The new station building under construction at Poznan. Fortunately the old station was still in business. Photo Chris White. The station facilities at Poznan, although also being re-built were much more inviting than those Wroclaw and, it being Friday afternoon, were very busy. The tram system in the area is also undergoing major investment but no tram map was available even on the Internet, which made exploring the city a bit hit and miss. (The map was uploaded on 15 May!) There was a massive thunderstorm just after my return to the Hotel Topaz and the temperature dropped from over 30°C to around 15°C where it remained for most of my stay. Ol49-69 and TurKol special at Poznan Franowo. Photo Chris White. Armed with a written list I went to the International Booking Office and bought tickets for the remainder of my stay. I had booked on the steam train trip from Poznan Glowny to Gniezno and received a warm welcome on introducing myself. TL49-69 headed four vintage carriages with frequent photo stops to Gniezno where the train was greeted by a fanfare of trumpets and a large crowd, many of whom opted to take a short trip on the steam train to Wrzesnia and back. Details and pictures on the TurKol website. It was a big disappointment that there was no train provided on the Gniezno narrow gauge line; although Px48-1919 was posed with TL49-69, it was not in steam. I spent the time looking round this historic little town and even made it to the top of the Cathedral tower, before returning to Poznan on the steam special, which was looped twice for overtaking trains. Back to Gneizno by TLK 65101, then on an ancient bus to Znin. Work has taken place to renew drainage culverts on the Znin Narrow Gauge Railway. Photo Chris White. A sudden rain storm meant that the shelter of the Znin Narrow Gauge Railway’s refreshment room was very welcome before it was time for the train to leave. There were a lot of people around in the Biskupin area but very few on the two trains operating and I visited the iron age fort as well as enjoying the train ride. A strategic retreat to one of the closed carriages was just as well as more heavy showers of cold rain developed during the afternoon. The station area at Gasawa has been improved recently by the construction of a new footpath to the centre of the village. I took the 16.10 bus from Znin bus station and, although it was going through to Poznan, I changed at Gneizno and took a Regio train back to base. The Znin Narrow Gauge Railway is to be congratulated on operating a daily train service and deserves every success in this area which is obviously popular with visitors. The town centre is quite attractive but the area around the now closed standard gauge line and station is looking very sorry for itself. Hopefully it will not be too long before this part of town can be re-developed. 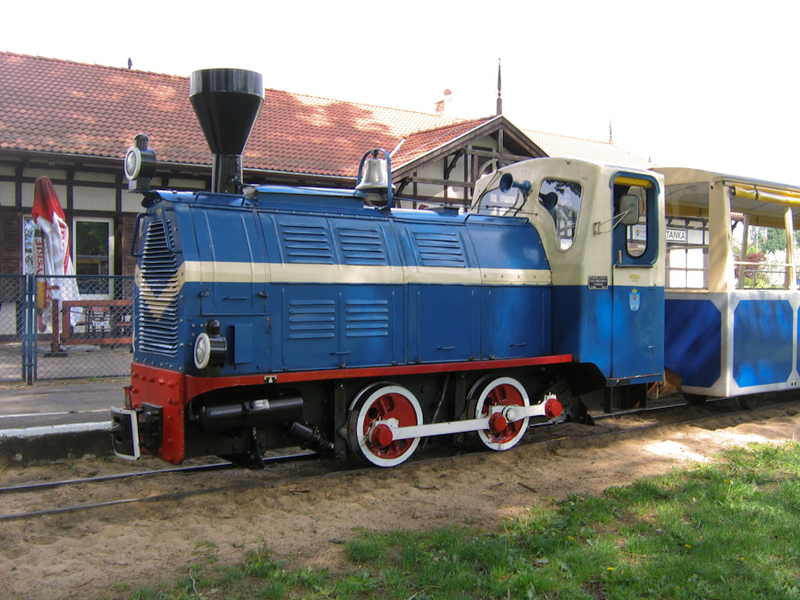 Wls40 built in Poznan in 1956 at work on the Maltanka Park Railway. Photo Chris White. Emil, one of my Polish friends, had recommended a visit to the 60cm gauge Kolej Parkowa Maltanka and I arrived there in time for the second round trip of the day. Being a Monday. a diesel loco was in operation. and I took a return trip before returning to explore some more of the long distance tram lines, or more properly, light rail lines. Then it was time to take TLK 83106 from Poznan to Lodz Kaliska (250km in 3½ hours). 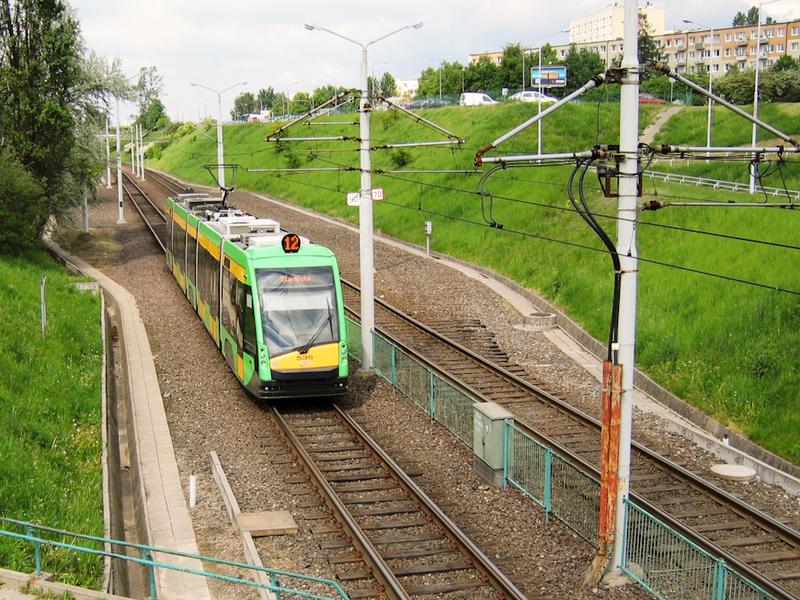 Poznan light rail – route 12 tram heading towards the city at Aleja Solidarnosci. Photo Chris White. 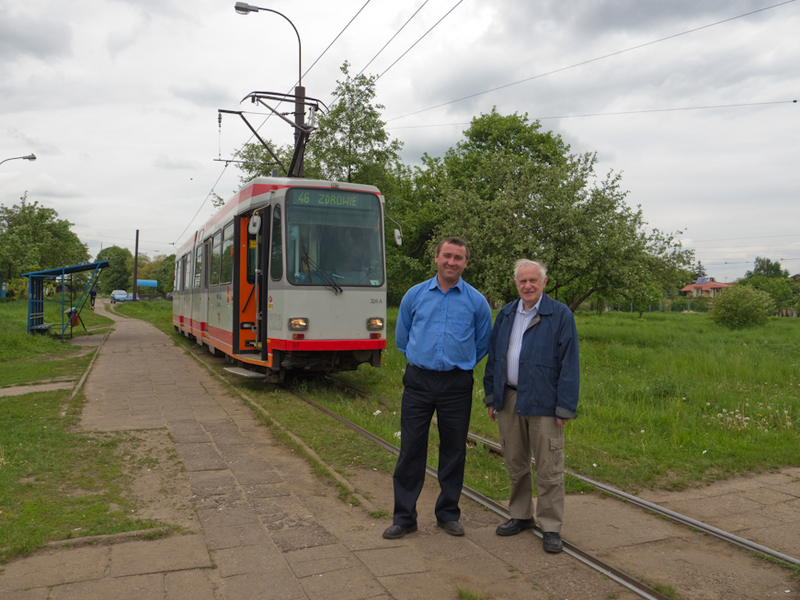 The day was spent exploring two of the three surviving Lodz inter-urban lines with Dyspozytor. Our first run was on line 46 out to Ozokow. This trip was delayed in both directions by a total of 30 minutes by cars crashing into the trams almost as if the local competing bus companies promote this kind of activity. A very friendly driver on the outward trip spoke with us for a long time at the terminus about hopes and fears for the remaining long inter-urban routes out of Lodz and told us that the tram company staff had been encouraged by the international support for the campaign to save the line. The track beyond the city boundaries is in a very variable state, mostly single with passing loops and in need of heavy repairs in places. Chris White and friendly tram driver at Ozorkow. Photo BTWT. We found (the only?) restaurant in Ozorkow and, after a schabowy (pork chop) for lunch, rode the line back into Lodz for afternoon tea with vintage tram owner and operator Tomasz Adamkiewicz. 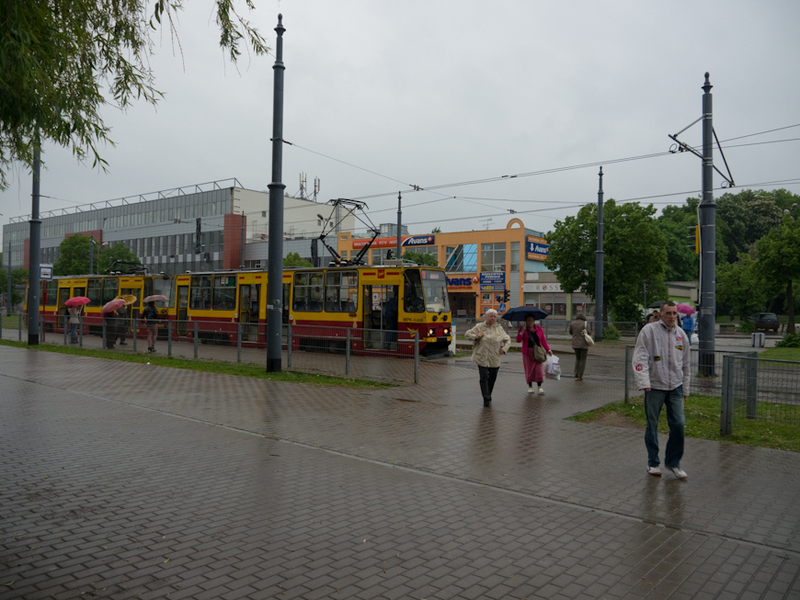 We changed trams at Plac Niepodleglosci and took service No 41 to Pabianice in the rain and gathering gloom. The track had been renewed as far as the city boundary but beyond the mixture of double and single track with sections of street and roadside running could do with some investment. Our service was operated by a single car which was pretty well patronised in the early evening. We changed trams and after a longish wait caught one of the city trams at Port Lodz. We reached our starting point near Manufactura. By now cold and damp was beginning to overcome us and Dyspozytor organised a rescue party to take us to his home for a very welcome hot meal. Plac Niepodleglosci, the start of line 41, the inter-urban service to Pabianice. Photo BTWT. Lodz Chojny dep 07:48 (TLK 16101) to Wroclaw Glowny arr 1:.20 – ten minutes late (250km in 4½ hours). A walk round the east side of the city revealed work going on to replace a lot of tram track on routes 0 and 5 and then I had a very late lunch in the Rynek. Buying a ticket for Bus 406 to the Airport again proved a problem. My cash stuck in the machine and another would be purchaser came and inserted their cash, banged the machine and shrugged and got on the bus so I did the same. At the airport I noticed the large number of internal flights and the new service to Lviv which has recently started. By Ryanair from Wroclaw dep 19:05 arr East Midland Airport 20:25. Lodz Chojny, the 07:48 departure (TLK 16101) to Wroclaw Glowny – one of the through services that does not call at Lodz Kaliska. Photo BTWT. On my return I was asked “How was Poland?” to which I replied “Very Polish!” I met lots of friendly people, except for bus drivers who were equally grumpy to every-one. I observed: a lot of re-construction going on at breakneck speed; many monuments to various episodes of the land’s troubled history; much good renewal of the infrastructure of trams and trains. However, a lot more remains to be done, especially to provide user friendly services and much faster connections on the main lines and to develop the full potential of local and tourist lines. Gniezno idyll. Some BTWT readers will remembers scenes like this on the Smigiel railway! Photo John Savery. For the last few weeks I seem to have been spending all my spare time in Poland. A Wolsztyn Experience organised charter was a great excuse for a trip out to Gniezno and a chance to view the narrow gauge line in operation, once as a passenger, and once to chase the train and photograph the line. For those who are not familiar with the railway, the Gniezno Narrow Gauge Railway forms the most western part of the one enormous Kujawy narrow gauge system, and is currently the only operational section. The political situation at the Krosniewice Railway have been well covered elsewhere on this blog, and the centre section around Sompolno did not survive the purge of narrow gauge lines following abandonment by PKP in 2001. The line survives down to Anastarzewo, however the charter trips were only down to Witkowo, an intermediate town. Blessed with glorious sunshine all weekend, the weather has been ideal for being outdoors. That coupled with a working narrow gauge steam locomotive, Px48-1919, made for a fun day out. Pottering along at 15 to 20 mph, through the Polish country side, with the sight and sound of steam has to be good for the soul. A very different pace of life to that in the UK, and a far more relaxed (but sensible) attitude to health and safety. No central locking doors here, and with both windows and doors flung wide to add to the ventilation, there probably isn’t a better way to see the Polish countryside. With the line hugging the main road down to Witkowo for part of its length, before diving into the countryside and around the back of villages, it’s easy to see the contrast between the paces of life. The modern bustle of traffic, then open fields. Wildlife abounds. Deer and hare are still common along the line, both bounding out of the way when approached by the iron horse pulling our train. So close is the line to the country roads that shadow it between villages, it is possible to transfer goods between rail and road vehicles without either of them stopping! Photostops were arranged for the outward journey to Witkowo, with multiple runpasts for the participants. At Niechanowo, the remains of the sidings and former junction can be seen, the rails into the siding covered with a thin layer of asphalt at the level crossing. At Witkowo, the train was watered, before running back tender first. No crane or column here, but a blockwork hut by the side of the line contains the water standpipe. The hose is stored within the tender coal space, pushed onto the pipe poking out of the hut each time it is filled. A steady run back to Gniezno was broken by a stop for refreshments. There can’t be many places where a train will stop by the roadside to allow the passengers to go for refreshments at a local bar! The railway has a regular service planned from mid-June until the end of August, at weekends and holidays, plus additional services on several other dates throughout the year. Further details are available on the railway’s official website: www.gkw-gniezno.pl . Protests by local residents killed the Gniezno Railway’s freight operations though in many cases the railway pre-dated the adjoining houses! Photo John Savery. Regulator sets up n.g. portal! The ‘World of Narrow gauge Railways’ according to UTK. With no effective umbrella body representing or promoting Poland’s tourist and heritage railways, it has fallen to Poland’s railway regulator, Urząd Transportu Kolejowego (Office of Railway Transport) to publish the first Polish language on-line atlas of operational narrow gauge lines. Although we welcome this atlas, it does seem a somewhat bizarre thing for the UTK to publish. Have they not got more urgent priorities in the wake of the Szczekociny disaster? Inevitably as always occurs with ‘first editions’, there are some omissions and inaccuracies. At first glance, two operational n.g. lines have been missed out, and one no-longer-operational line has been included. We invite readers to submit their own corrections to BTWT. We will consolidate the corrections into one document and forward it to the UTK. 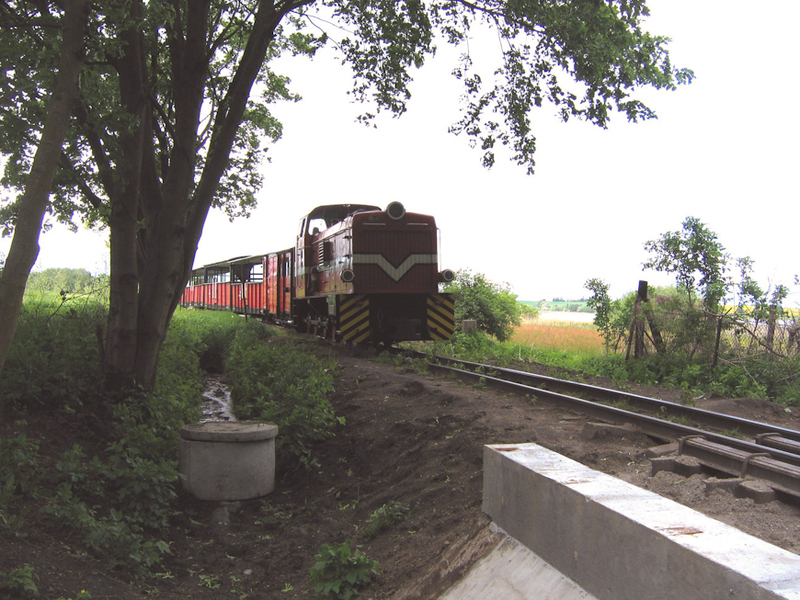 For readers planning their own visit to Poland we also recommend accessing Ed Beale’s own Narrow Gauge Railways in Poland portal for up to date information regarding operations in 2012. For information about the history of the lines Andrew Goodwin’s Polish Narrow Gauge Railways – though now somewhat dated – remains an invaluable resource. 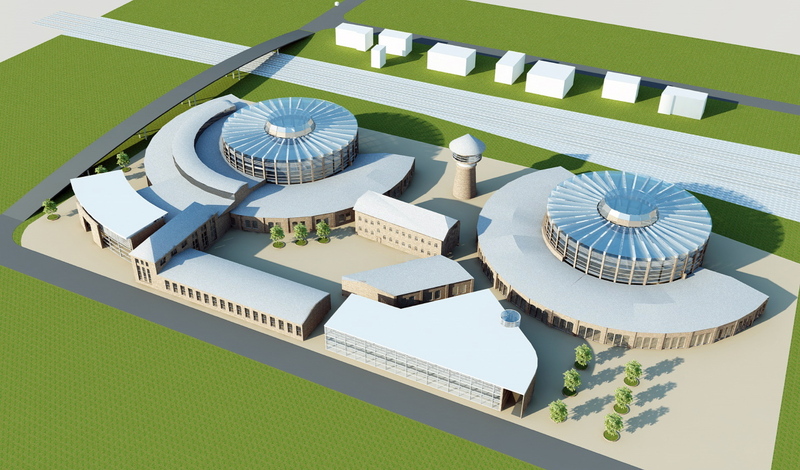 One of the visualisations for the future development of the Gniezno depot site prepared by the Poznan branch of the Polish Town Planners Association. Stripped of their historic context the 19th century buildings lose their meaning. PKP archive. Such an analysis was also carried out with respect to the real estate adjacent to Gniezno station including inter alia the area of the former locomotive depot, the subject of your concern. As a consequence of this, the current plans of PKP SA take into account the above principles regarding the management of real estate, according to which this real estate could be disposed of by means a sale by tender; always taking into account the possibility of a disposal taking place without a tender to a local authority or the state treasury; although such a disposal would be conditional on receiving the assent of the Minister for responsible for transport matters. a strategy for the development of Wielkopolska province, describing a vision for the development of this region, indicates that the Wielkopolska should be an integrated and competitive region. In accordance with this concept, the area of the former locomotive depot was zoned for multiple retail and service industry use. The concept involved the creation of a retail-cultural gallery with a wide range of functions: retail, recreation, sports, office, cultural-theatre, cinema, exhibition space and gastronomic. The 19th century locomotive depot, which was recently added to the list of historic buildings, would have a chance to combine commercial and cultural uses in a refined industrial interior. New buildings in the shape of cylinders would form atria to the roundhouses and maintain a height sympathetic to existing buildings (Please see visualisation.) No changes to the internal structure of the building is anticipated. There is an assumption that a public space would be created dedicated to the culture of steam and electricity. There would be the possibility of displaying steam locomotives, for example. The revenue stream from commercial activities on the site would provide an opportunity to preserve and maintain the historic aspects of these buildings. However, the way the space would be utilised according to this concept is not yet finalised. In matters concerning the development of its real estate within Gniezno, PKP SA is cooperating on the basis of a tripartite agreement which was reached in November 2009 between PKP SA, PKP PLK and the City of Gniezno. The subject of the agreement is the stipulation of the general principles to be adopted in implementing development projects in Gniezno. Accordingly it is planned to breakdown the development tasks into concrete actions with specified targets and to identify the legal and the necessary legal milestones of the anticipated works as well as sources of finance. The area of the former locomotive depot was recognised as particularly important for the purposes of changing its existing role on account of the planning policies and the investment needs of the City and PKP SA. Discussions are also taking place in other fora regarding the development of this area. Above all, PKP is concerned to achieve the rational development of railway real estate taking into account the economic needs of the company. Hence great care is taken with regard to the choice of future investors. In the case of real estate which has a heritage value, there is also an additional obligation the – the manner of its preservation must conform to the requirements of the Heritage Conservator. Skierniewice Roundhouse, which comprises the first and largest, entirely private, collection in Poland of historic rolling stock owned by the Polish Railway Enthusiasts Association (PSMK) – one of the oldest and the largest organisation grouping Polish railway enthusiasts in the country. The PSMK collection, gathered within the walls of the roundhouse contains over 100 items of rolling stock represents a cross-section of European railway rolling stock construction (steam engines, diesel engines and passenger and freight rolling stock) from the second half of the 19th century the first half of the 20th century. Only part of the rolling stock collection is in operational condition; the majority of items still await their restoration.The title to the real estate within whose area the roundhouse is located was transferred to the town of Skierniewice on a commercial basis during the period when PKP was still a state enterprise, in 1998, in exchange for tax liabilities. Up to the year 2005 was only possible to visit the roundhouse by earlier arrangement, only then was the decision made to provide access on a regular basis to tourists. The Slask Museum of Industry and Railways in Jaworzyna Slaska, which is located on the 49th kilometre on the railway line from Wroclaw to Swiebodic. In 1843, Königszelt railway station was established here. Several decades later at the end of the 19th century a locomotive depot was established to serve the developing junction; a second was built in the 20th century.The title to this real estate was transferred by PKP to Jaworzyna Slaska municipal council on a non-commercial basis. The current museum was established on the basis of an existing disused ‘skansen’. 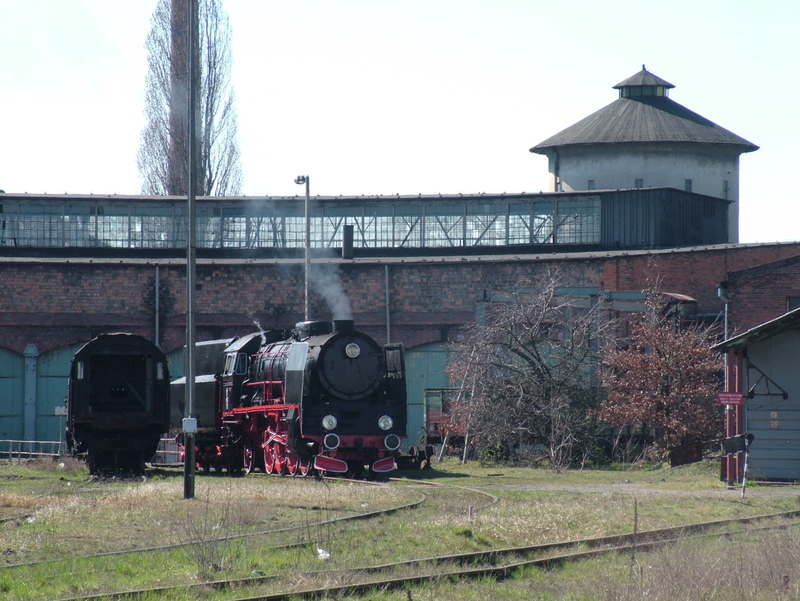 The municipality and sponsors take care to maintain its attractiveness by acquiring further exhibits.Several attractions await visitors from the age of steam including the beautiful largest surviving roundhouse in Dolny Slask province. Inside is a unique rolling stock collection, currently undergoing repair and renovation, displayed on some 1.5 km of railway track. The collection spans the period from 1890 to 1970 and contains over 50 locomotives (built in Poland, Germany, Austria, England and the USA) and 50 wagons and coaches as well as water cranes and a snowplough. Visitors can enjoy a run on a hand powered trolley, look at the collection of old railway documents and souvenirs and may spend the night in the sleeping coach and directors saloon that was once used by the PKP board. Future plans include restoring a steam locomotive and a rake of historic coaches which could operate as a vintage train on the railway lines in Dolny Slask province. As can be seen from the above examples, if the local authority decides that it would be appropriate to take over this real estate from PKP SA (irrespective of the way in which this might take place) it will be important that the resources and financial means are in place to take over the roundhouse and operate it as a museum or skansen. Should such a proposal be submitted to PKP SA it will be carefully analysed and decided upon by the main board. In reply to your letter expressing your concern that the hundred-year-old buildings of Gniezno locomotive depot should be conserved for future generations, I would like to take this opportunity to explain the current PKP SA position and the actions taken so far regarding the matter. Your letter confirms your interest in Poland, and specifically its railway heritage, so I am sure that the general situation regarding Polish railways will be familiar to you. Since the end of the 1980s, the country has been undergoing a social and economic transformation and this, taken in conjunction with the rapid changes in the world’s economy, has demanded that the country’s railways also undergo an appropriate transformation. Under the aegis of a special Act of Parliament regarding the Commercialisation, Restructuring and Privatisation of the State Enterprise, Polish State Railways, the state enterprise Polish State Railways (PKP) has been commercialised and transformed into a joint stock company, PKP SA. The next step that took place was the creation of a number of subsidiary companies. Utilising the appropriate real estate and human resources of PKP SA a number of companies were created: operating companies; a company to manage the railway infrastructure, and companies providing support services to the latter, as well as other companies whose activities are not connected with railway transport. A historical debt of several billions dating back to the times when PKP was a state enterprise was retained on the books of PKP SA and the management and repayment of this debt remained the responsibility of the company. PKP SA also retained responsibility for companies controlling real estate and human assets that were surplus to its requirements. In spite of many positive effects of the restructuring process there were serious time delays caused by the unavoidable procedures necessary to regularise the legal status of real estate and to prepare the subsidiary companies for privatisation. Consequently the situation arose whereby the proceeds from asset sales proved to be insufficient to meet the actual requirements needs of PKP SA and the company continues to experience financial problems. In such a situation PKP SA, bearing in mind its responsibilities and mindful of its statutory responsibilities and other legal obligations, takes particular care with regard to the optimum development of real estate in order to achieve the most favourable financial effect. As part of the process of optimally managing its real estate portfolio PKP carries out analysis of the commercial potential of land no longer required for railway operational use and for which a future use should be indicated. Much of this real estate has heritage value. 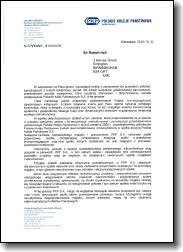 Such an analysis was carried out also with regard to the real estate adjacent to Gniezno railway station including the area of locomotive depot which was the subject of your letter. Ol49-32 awaits it fate at Gniezno on 20.9.2010. I have just read (on Tomislaw Czarnecki’s site) that the scrapping of Ol49-32 at Gniezno has been going on today. The attached shows the state of the loco on 20 September – not a pretty sight, but no worse than some Barry wrecks that have been restored to working order. Nevertheless, there are plenty more locos in Poland with uncertain futures, and whilst I am not condoning the scrapping, saving key components )such as axles and frames) for other locos would surely have been a logical step? 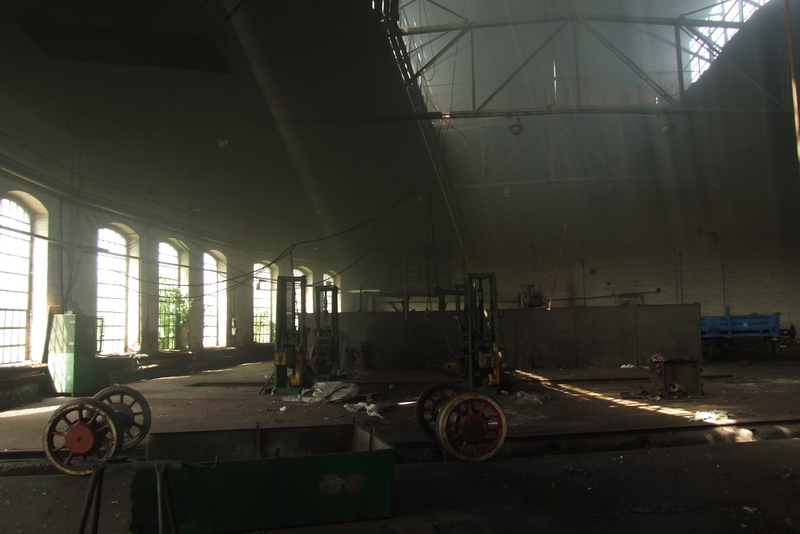 Last June, we reported on PKP’s plans to destroy the two historic Prussian roundhouses at Gniezno and to level the site so that developers could build a shopping mall and office complex. Now a group of local residents is campaigning hard to save the buildings with a view to creating the Wielkopolska Railway, Technology and Culture Park on the site. BTWT has been asked to help and we are delighted to give our support to the campaign. A petition is being organised by Robert Gawel, one of the members of Gniezno City Council and signatures are being collected by volunteers . 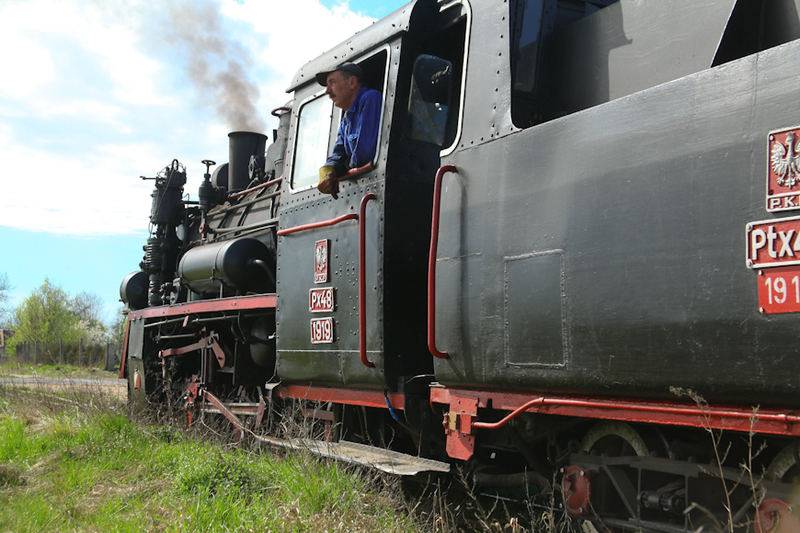 There will also be opportunities to sign the petition during the coming weekend at the Parowozjada steam gala at Chabowka. The City of Gniezno has a history which goes back to the beginnings of Poland and the historic railway complex is an important part of Poland’s railway heritage. The site would be ideal not just as a railway and technology park for Wielkopolska, but would also be an excellent location for a Polish national railway museum complete with workshop facilities on the lines of Britain’s National Railway Museum in York. What better site to house some of the Warsaw museum engines and the other historic rolling stock? Since the abandonment of PKP’s regional skansens the majority of Poland’s steam engines, passenger coaches and goods vehicles are in a scandalous state. There is as yet no plan to provide covered accommodation for Poland’s fast decaying decaying national collection. Gniezno could solve the problem at a stroke. My special thanks to Marek Ciesielski for digging into his archives and providing – at very short notice – these magnificent photographs of Gniezno shed.